How to categorize this book? Part memoir, part essay on art, part essay on philosophy, artwork, journal, graphic narrative. Then, if you don’t really know what it is, how do you determine if it is good? What It Is can be viewed as a sort of textbook for a class on imagery. 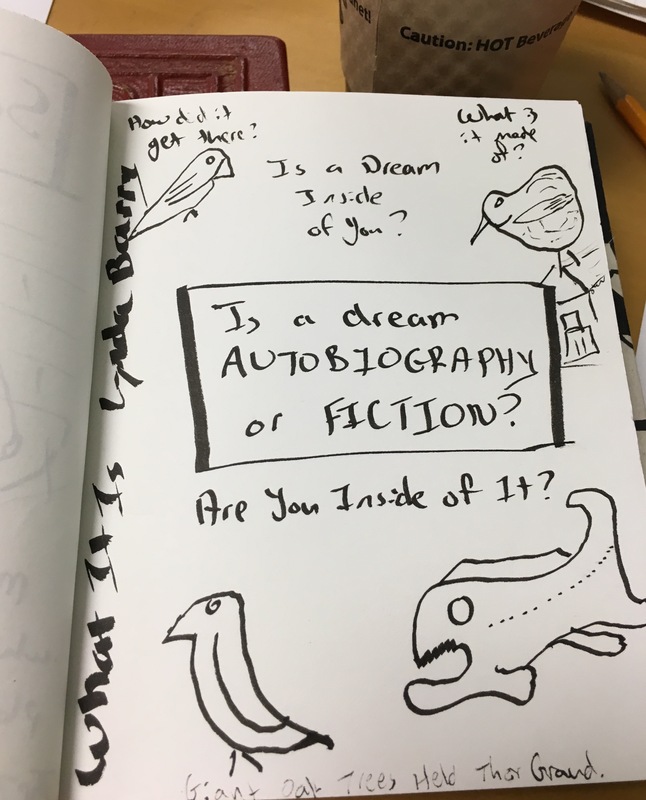 Each section of the book deals with some aspect of imagery and imagination along with how each relates to story and to dream. 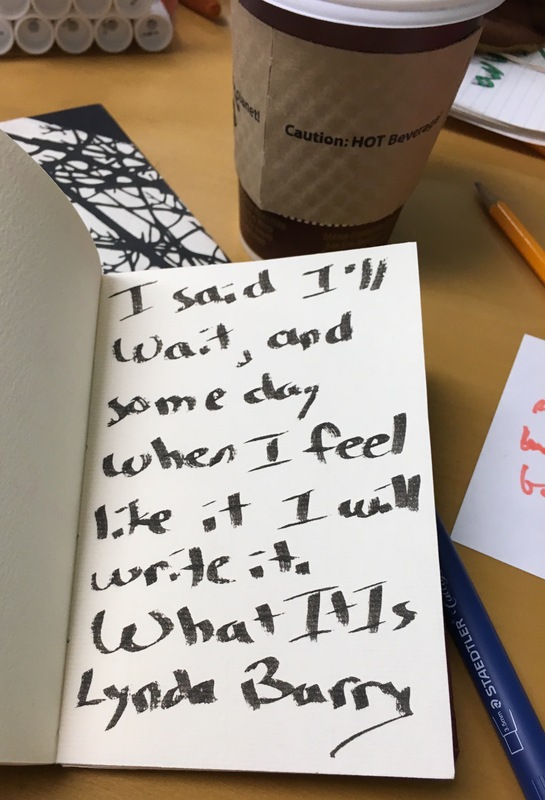 A page might feature a question or two, a proposed answer sometimes, a brief anecdote from the author’s life, how she struggled to become an artist even before she knew that’s what she wanted to become. Here’s a page from her book. I like the question. We’re meant to think about the questions but not to answer them, not really. The text after it reads “Even though an image is not a thing to be seen or touched, it can be stored.” I like that comment because it suggests an answer. 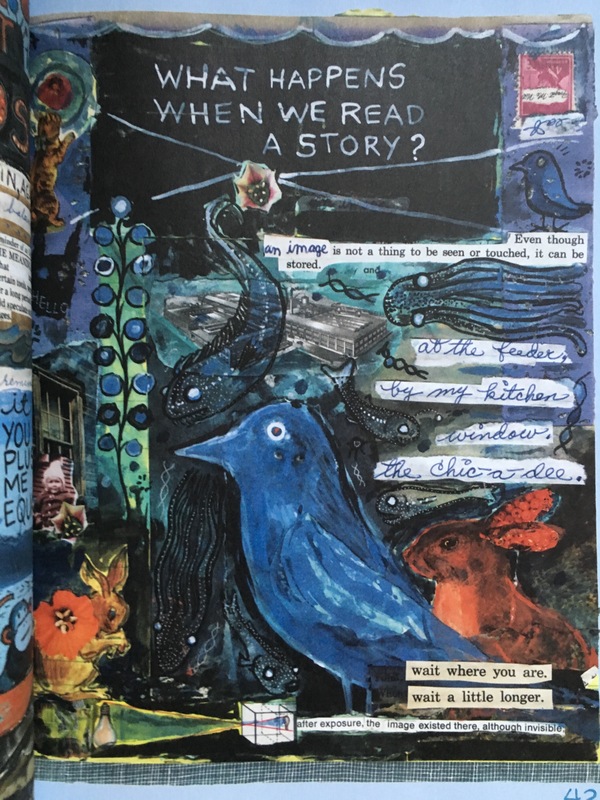 When we read we go to a bank where images are stored, pull out the ones we need to make sense of what we read. Think about this idea that an image is not a thing that can be seen. True, yes? But not something I ever considered before after a lifetime reading and teaching books full of images. An image is not a thing to be seen. I found many of the pages/ideas in What it Is to be very thought-provoking, almost like idea worms I couldn’t get out of my head. I was thinking about some of them for days afterwards. Here is a drawing I did of my favorite page. I included all of the text. I’m still thinking about this question, no closer to an answer than I was last week when I first read it. The drawings in my journal match the drawings Ms. Barry did on this page. While I found the ideas in What it Is thought-provoking and I enjoyed the rest of the text, I didn’t like the artwork all that much. I think what I don’t like about it is probably what many of her fans like most about it. She worked here on yellow pads, making notes and drawings over a long period of time while she worked on other projects. There’s an improvisational quality to each page that reflects this. They are not so much planned as they are focused on an idea. I expect she had many, many pages going at the same time, working on each as the mood struck. But each page becomes so full of imagery that the overall effect struck me as muddy. I think this is partly the result of using watercolors on yellow pad paper. I also grew tired of the repeated use of fish and bird profiles. These are both typical of art journals, at least those featured in the crafting magazines I used to buy like Somerset Studio. I’ve kept an art/journal for many years now, using the blank books I make myself. I used to subscribe to Somerset Studio as a source of ideas, but the proliferation of articles and artwork featuring bird profiles finally drove me away. I don’t like bird profiles. So I don’t think I’m the guy who can really say if Ms. Barry’s artwork is good or not. Someone who likes bird profiles should be the judge. I will say that I liked her enough to take at look at more of her work. The instructors who first recommended her to me think that Syllabus is her best book, so I’m going to pick that one up sometime. So that’s my final word I guess, kind of a mish-mash. I didn’t outright love What it Is but I liked enough to want more by Lynda Barry. 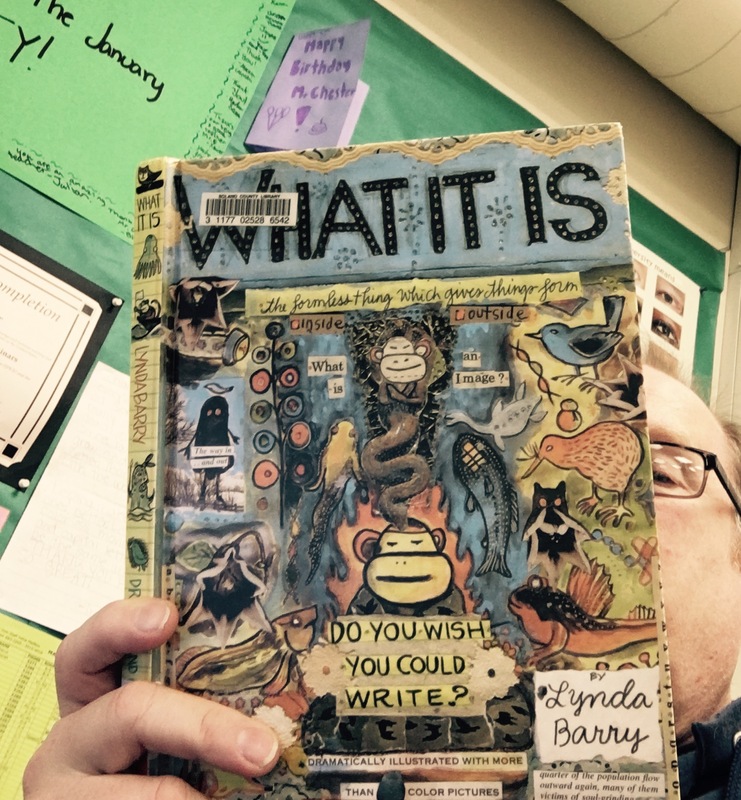 I’m gonna give it a go because, Lynda Barry!!! I love your review.